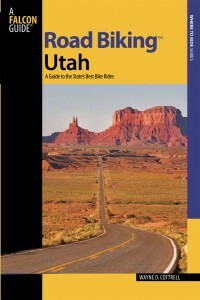 Road Biking Utah, written by avid cyclist Wayne Cottrell, is a Falcon Guides imprint featuring descriptions of 40 road bike rides in Utah. The ride lengths range from 14 to 106 miles, and the book’s coverage is statewide: from Wendover to Vernal, and from Bear Lake to St. George to Bluff. Each ride description features information about the suggested start-finish location, length, mileposts, terrain, traffic conditions and, most importantly, sights. The text is rich in detail about each route, including history, folklore, flora, fauna and, of course, scenery. The following is an excerpt from one of the rides in Road Biking Utah; #23, Golden Spike Challenge. The Golden Spike Challenge is a 57.7-mile ride combining a 42-mile loop with a 16-mile out-and-back segment. The origin and destination are the city of Tremonton and the Golden Spike National Historic Site, respectively. In between, the route skirts the perimeter of the ATK Thiokol facility and attacks the Blue Spring Hills. Significant climbs are featured in the latter, and on the road to Golden Spike. The elevation ranges from 4,291 feet just west of Tremonton to 5,420 feet at the crest of the Blue Spring Hills. Start at Tremonton City Meadow Park, 600 West between 720 South and 800 South in Tremonton. To get there, take I-15 north to I-84 north; take exit 41 (Tremonton), and turn right onto 11200 North. The road becomes Main Street upon entering Tremonton. Turn right onto 1000 West (Iowa String Road) and head south. Turn left onto 600 South, then turn right onto 634 West. The road curves left, becoming 720 South. Meadow Park is adjacent, on the right. Park on the opposite side of the park, near 800 South and 660 West. On May 10, 1869, a golden spike was driven between the final two eastbound and westbound rails of the transcontinental railroad, linking the western and eastern United States for the first time in history. The golden spike was driven at Promontory Point, immediately north of the Great Salt Lake in what is now Box Elder County. Service continued along the Promontory Point segment until 1904, when the Lucin Cutoff was constructed across the northern part of the Great Salt Lake. The bypass reduced traffic along the Promontory Point route drastically. By 1942, the railroad tracks on this route, having been all but abandoned, were ripped up and sold for scrap (the materials were sorely needed during World War II). The significance of the site was not lost; some have argued that this was the most important American event of the nineteenth century. The Golden Spike National Historic Site (NHS) was authorized by Congress in 1965. Tremonton is the closest city to the Golden Spike NHS. The city (population 6,789 in 2008) was founded in 1888, although it had been settled earlier by French-Canadian trappers. The city is located at the junction of the I-15 and I-84 freeways and is an important crossroads. The city is home to La-Z-Boy and Malt-o-Meal, both familiar brand names. Tremonton is also the closest city to one of ATK Thiokol’s plants, a rocket and missile propulsion development company. Thiokol has produced the Pershing, Minuteman, Trident I and II, and other missiles, as well as rocket motors, low-earth orbiting vehicles, ski lifts, and other innovative technologies. The Golden Spike Challenge passes by the ATK Thiokol facilities, giving the cyclist a chance to see some of their products on display (please see photo). Start by heading south from Tremonton City Meadow Park on 660 West. Turn left onto 1200 South (Rocket Road) at mile 0.3 and head west. Turn left onto Iowa String Road (1000 West) and head south, passing under I-84. Turn right onto 10400 North at mile 0.9 (also called Rocket Road) and head west. The road passes through some of the agricultural areas of the fertile Bear River Valley, with the Blue Spring Hills looming in the distance. Continue straight at mile 6.0 onto SR 102, the main road through this area. The road negotiates a series of left- and right-hand bends over the next 10 miles. The highway passes through a series of unincorporated communities along this stretch, including Bothwell, Thatcher, and Penrose. Penrose was named for Charles W. Penrose, a Mormon church official, editor (Deseret News newspaper), poet, and composer (lyrics for several Mormon hymns). Highway 102 ends at mile 15.7; leave this interesting area by turning right onto SR 83 and heading west. SR 83 is a barn-burner of a highway: relatively straight, flat, and very fast. There are wide shoulders, though, so the highway is suitable for cycling. The Great Salt Lake is across the spacious mud flats on the left. Turn left at Lampo Junction (mile 19.2), toward Golden Spike NHS. The visitor center is open from 9:00 a.m. to 5:00 p.m. The road climbs into the Promontory Mountains at mile 21.5. The hillsides are laced with rocks that date from the Cretaceous Period. The climb crests at mile 23.4; here, you are surrounded by desert scrub, possibly wondering if you took the wrong road. The road bends left at mile 25.9; enter the Golden Spike NHS at mile 26.7. The railroad crossing at mile 26.9 confirms that this is where the eastern and western United States “joined hands.” Turn right to enter the visitor center parking lot at mile 27.0. Take time to refresh, and to learn about the Transcontinental Railroad. Complete the lot loop and return to the main road. Head out, turning right at mile 28.5 to continue on the main park road. The road turns downhill at mile 30.9 (watch your speed) and levels at mile 33.1. End the out-and-back segment at mile 35.2 by turning left to head west on SR 83. The ATK Thiokol rocket display appears on the right at mile 37.0. One of the items on display is a space shuttle reusable solid rocket motor. Continue on SR 83, passing Engineer Mountain on the left. The highway makes a large horseshoe around the perimeter of the ATK Thiokol plant, eventually turning eastward at mile 41.6. The road becomes 12000 North at mile 42.6 (keep straight at the T intersection). The road begins to climb into the Blue Spring Hills. There are five cattle guards over the next 5.6 miles. The road gets steeper in stair-steps, finally cresting at mile 47.8. From the top, the view of the Bear River Valley floor is commanding. Begin a fast descent here—watch your speed in the curves. The highway starts to level at mile 51.0 as you return to some outlying residences. At mile 51.5 you are once again on SR 102. The I-84 overpass at mile 55.0 announces the entry into town. There are several convenience marts and eateries along this stretch. Enter Tremonton at mile 55.4, and cross under I-15 at mile 56.0 (now on Main Street). Turn right onto 1000 West at mile 56.6 and head south. Turn left onto 600 South at mile 56.6 and enter a Tremonton residential area. Turn right onto 634 West; the road bends left, becoming 700 South. Meadow Park is on your right. To return to the start, continue along the border of the park. The ride ends at 800 South and 660 West, at mile 57.7. 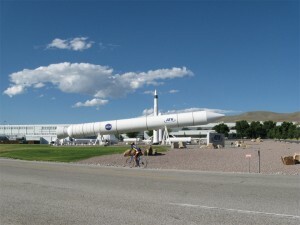 A rider passes by ATK Thiokol’s rocket display on Highway 83, west of Tremonton. Wayne Cottrell is a former Utah resident who conducted extensive research while living here – and even after moving – to develop the content for the book. He has appeared at the Tour of Utah to sell autographed editions. One Response to "Golden Spike Challenge Route is Historic Journey"
I made use of your Falcon Guide for a couple weeks of Utah road cycling earlier this month. It was a great aide in routing. At the same time, I have some comments and recommendations that may be useful in a future edition. If you’d like me to email them on, let me know to which address.